During our trip to Puerto Princesa, on our second city tour, we visited attractions that are outside the city proper. We went to Irawan Eco Park in the morning where we tried the zipline, then to see the crocodiles and endemic animals at PWRCC. Our next stop was Mitra’s Ranch and Baker’s Hill where we had a view of Honda Bay atop the Sta Monica hills. After enjoying the cool breeze at Mitra’s Ranch and adoring the manicured gardens at Baker’s Hill we took off down south to check the Binuatan Handloom Weaving Creations and left at around 3:00 pm to head back to the city. Since our last meal was during breakfast and just ate some of the hopia that we bought from Baker’s Hill, we already felt hungry by the time we arrived at Binuatan. 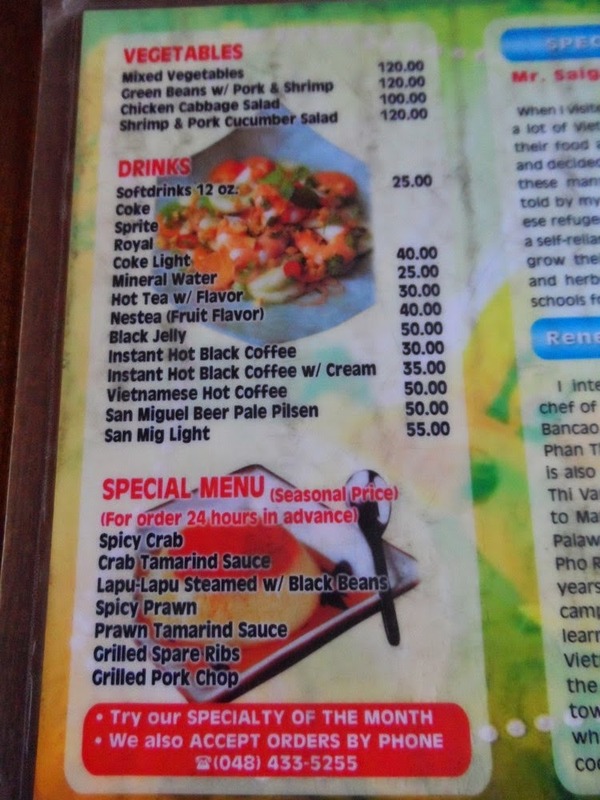 We were supposed to go to Vietnamese Village after Irawan Eco Park which is far up north of Puerto Princesa and further than the Sta Lourdes Wharf, because I’ve read from blog reviews that it’s in Viet Ville that you can taste authentic Vietnamese cuisine in Palawan. But our tour guide during our Honda bay Island Hopping Tour said that we need not go that far since we can also find authentic-tasting ones in the city and she recommended that we go to Rene Saigon Vietnamese Specialties. Wondering why there are lots of Vietnamese restaurants or eateries in Puerto Princesa? Well during the Vietnam war, a lot of Vietnamese refugees fled to Palawan and set up a refugee camp there. Most of them immigrated to the United States, but some chose to stay. But what have definitely remain is their influence on Palawaneno’s palate. At Rene Saigon Vietnamese Specialties you’re sure to get the authenticity that you’re looking for; this is because Rene isn’t just any other local who just inherited the secret recipes from one of the Vietnamese refugees who used to own an eatery during their stay in PPS, he is in fact a half-Filipino and half-Vietnamese. His father is a Filipino while his mother is a pure Vietnamese and Rene also married a pure Vietnamese woman, both of are refugees. When you go there, you can find at the back of the menu the history behind this humble Vietnamese restaurant. Rene Saigon sits on a 800 square meter lot along Rizal Avenue Extension, just near the Puerto Princesa Airport. Don’t expect any extravagant restaurant, or as artsy as KaLui’s. It’s a quaint restaurant, made of native construction materials, with a few paintings and décor that reminds anyone that this is in fact a Vietnamese restaurant; it’s not air-conditioned either, makes you wanna feel the full experience of being in a tropical place. Nothing fancy but clean and well maintained. The owner, Rene prides himself of being hands-on with the business, of the French bread that he bakes ( hundreds of it, everyday) and their home-made noodles. Some of the ingredients used for their menu items are grown in their backyard like basil, mint, chilies and other veggies and the others are imported directly from Vietnam. When we were about to leave we saw him came up to the restaurant’s counter, Bryan told us Rene is usually in the restaurant at around that time after baking and delivering French bread to other restos in town. I wished to talk to him and have a photo taken with him, but realized he might be tired so I just didn’t bother him anymore. Anyway, since we grew very fond of Bryan and we really did find him a really nice and honest family man, we asked him to join us for an early dinner. He refused but we insisted because we haven’t seen him eat the entire day except for the bread we gave him from the one we bought in Baker’s Hill. We had a small talk while eating, I found out that Bryan’s son is a huge fan of UFC and on that day it was his son’s birthday. He told us he was really glad when we texted him the night before to avail of his services, he now had the chance to at least treat his son out for his birthday. I know how much we paid him is just the usual rate plus some extra tip, but hearing his story just put joy in my heart. I realized how blessed I am, and how like Bryan, I should be contented in life and see every day as an opportunity to thank the One who has made all things possible. I know what we paid Bryan, isn’t that much, but I’m thankful we were used to bless him especially on that special day. 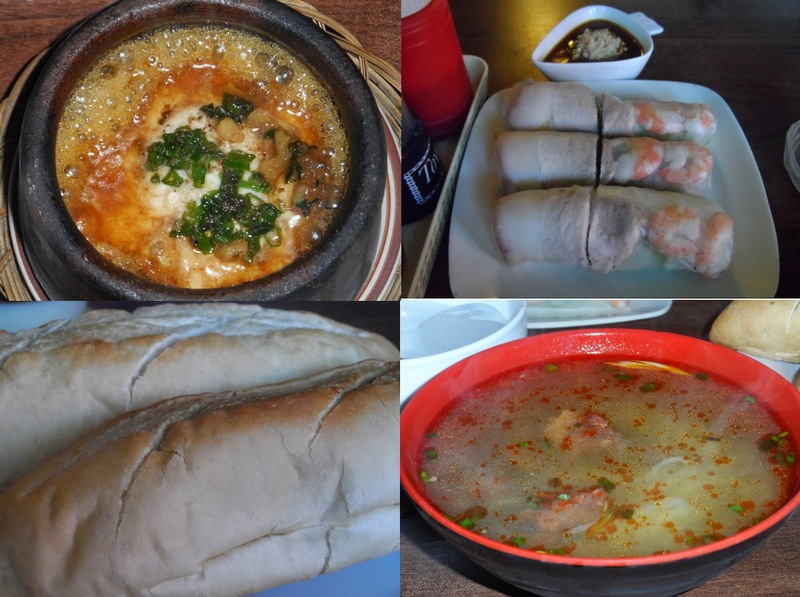 Ok, going back, before I get too emotional, let’s talk about the food that we ordered, our other orders were Vietnamese Rice Noodle Soup (Beef Stew with Noodles) and Plain French Bread. I wanted to try something else so I got Spicy Fish (which wasn’t so spicy at all), Fresh Spring Rolls with Pork and Shrimp (which I shared with them) and Vietnamese coffee (which I asked to be served cold/iced). The price at Rene Saigon is a little bit higher than that of Bona’s Chaolong. Taste-wise, not that much difference really, but there’s more choices at Rene Saigon. 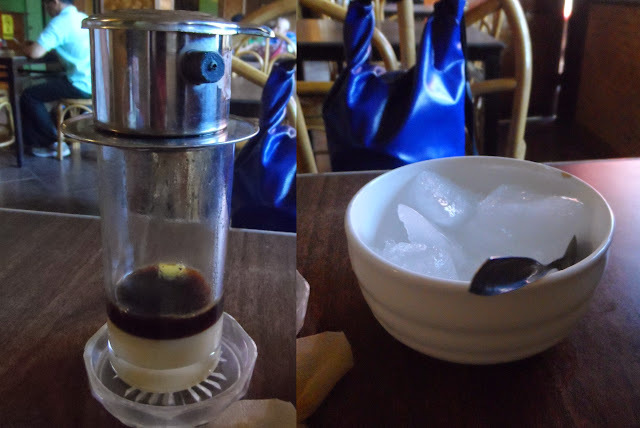 I like the Spicy Fish, although it was super hot when it was served to me in a clay pot (which I find super cute), and the Vietnamese coffee was pretty cool and authentic, because you have to wait until the all of the brew has dripped down to the glass before you can put some ice. I really love fresh spring rolls, but I kinda find it icky to eat the raw pork that’s inside the roll (I’m sure it’s kinda raw or maybe it was steamed but wasn’t cook thoroughly), good thing the dipping sauce was super yum that it masked the rawness of the pork’s fat. All in all we had a great day, and we were glad that we’ve met Bryan and all the other people we’ve come across and were able to have small conversations with. Bryan drove us back to our new home while we're in Puerto Princesa: Purple Fountain Courtyard Inn. We thanked Bryan, said our goodbyes and wished him well. If God gives us a chance to go back to Puerto Princesa, we will definitely look for and contact him.